Brett McClure sat down with Kensley Behel in an exclusive interview to talk about the direction of the Men’s Program, as well as his role as the High Performance Director. A former elite gymnast himself, he has definite and direct goals, while also acknowledging that his position is a work in progress, as is his team. One thing is for sure, Brett is happy in this new full-time role based in Colorado Springs and it radiates on his face and through this team. In a joy that has rarely been seen as of late among recent scandals within both the men and women’s program, there is at least one man making his mark to create positive changes. At age 16, Brett moved to the Olympic Training Center (OTC) in 1997 and trained under Ron Brant, a place where he would call home for the next 10 years. He came to the OTC after an injury at the Pan American Championships and was looking for the best medical care available to him. He won three major international medals, silvers at the 2001 and 2003 world championships and also in Athens at the 2004 Olympic Games. When asked if there was anything that he wished that had been provided to him in his training that he is now able to provide in his current role, he said he was given what he needed and was able to achieve everything that he wanted. It’s in that confidence that he is able to give back to those currently under his tutelage. Brett views his main role as one of support and accountability, notably one that is separate from the relationship between the athlete and his personal coach. “I don’t want to interfere in their work. If it’s working, keeping doing it. If you force something, it’s not going to get results.” he said. It’s a reality that is evident as world-medalist, Donnell Whittenburg, was left off the national team. “I’m just as disappointed that he’s not on national team, but if you choose to compete, you have to earn your spot.” Brett said. Brett clarified that Whittenburg could have petitioned to the World Selection Camp; it was a choice solely between him and his coach. Coming back from injury, he needed a few more weeks before he was really ready, but the decision was made and the results stand. It is part of the accountability system that Brett has worked to implement for his program. Brett’s goal is progress and he sees that within one of the all-time greatest American gymnasts, Sam Mikulak. Sam is good, really good, but he has an Achilles heel and it’s not the one that required surgery last year. His Achilles heel is his ability to consistently go 6 for 6, but Brett has his own experience with inconsistency. For Sam, and for each of the gymnasts, he provides them with the education needed, but ultimately, it’s their choice to see one of the three sports psychologists available to them. This doesn’t mean, however, that Brett doesn’t offer other tips on making successful routines. He teaches them how to slow their heartbeat and how to work on deep-breathing techniques to give them the best chance for success. He want his athletes to let their brain get out of the way and to let the muscle memory be second nature. He gives the athletes a voice and feels good about the communication they’ve built between the staff and the team. It’s a priority for him and there are actions to back his words. At the beginning of his tenure with USA Gymnastics, he told each of his gymnasts that they would receive a clean slate. The athletes and coaches together formed a strategic plan for the quadrennium as a group. Camp is now a priority and so is showing up when it counts. In some previous camps before his position was finalized, camps would consist of as little as three gymnasts. To maximize the efficiency of these training sessions, there are now only four to five camps per year to try and serve the needs of the athletes. Sometimes those needs focus on team building and community. During the May camp, the coaches chose to cut practice to allow the athletes a chance to go hiking in the Cheyenne Mountains. It was a welcomed break by the gymnasts and one that allowed them to spend time together out of the gym. Some camps are easier than others. March camp is the hardest for the gymnasts because of conference championships. An NCAA coach for 10 years, he understands the difficulties of balancing life between the two worlds. Concerns include skill development which is a much-needed step to boost D-score values to compete with the best teams in the world. Competing simultaneously as an NCAA and elite gymnast takes its toll as gymnasts Allan Bower and Yul Moldauer shared their experiences earlier this year. It’s a reason Brett himself chose to go professional. However, as a coach, he successfully helped utilize the Olympic Exception option offered by the NCAA. Leading up to the Olympics, an NCAA athlete is allowed to redshirt that year to focus solely on training for the Olympic Games. His former gymnast, Ryan Patterson, was able to utilize this option and successfully competed at the Olympic Games for South Africa. 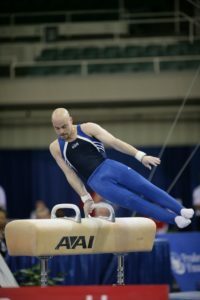 Brett reiterated that he provides each of his gymnasts with the educational tools necessary, but leaves the final decision up to the athlete and his coach. While there still remain limitations within the NCAA system in relation to the Elite schedule, Brett pointed to the benefits of having a gymnast compete in both seasons simultaneously. He pointed to Yul Moldauer specifically and his love of team. He spoke of how Yul brought this same love of team to the elite scene and the bond that it has helped develop between the athletes. “That’s where college is so important.” Brett said. That comradery will benefit the team well as they head to Doha, Qatar next month to compete at the World Championships. Though this is Brett’s first team World Championships as High Performance Director, heading to Doha the goals are clear: 1. To bring home a medal as a team. 2. To bring home as many individual medals as possible. 3. To go 18 for 18. In the strategy for choosing the team, Brett said that they looked at different options, including best scoring, most consistent, and the opportunity for the most individual medals. “We have to be the best version of ourselves.” Brett said. The best version of this team is one that has been closely watched as Brett has tracked each gymnast over the past year with his statistics program. They track all of their results from Winter Cup and National Championships. They also track each camp and international assignments as well. All of the results are saved for each team member in an accessible online database. Brett can log into any gymnasts record on the national team and see results, videos, scores, judges reports, travel tips, physiology, nutrition, bloodwork, hydration levels, etc. He, and the selection committee, are able to see trends, variances, and red flags that help choose the most successful team. He believes it makes not only the gymnasts, but also the members of the selection committee more accountable, because whatever a gymnasts does, even at a camp, is now in his profile forever. Brett McClure was not shy about his current team. He said, “We need to be better.” It’s a sentiment echoed by much of the gymnastics community and a voiced pragmatic realization by the High Performance Director of the Men’s Program. He believes that Team USA is strong on pommel horse and that floor looks good. 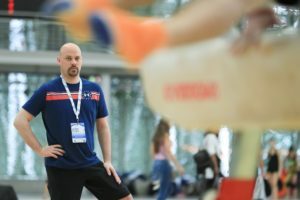 He believes that a healthy Team USA can compete with anyone in the world on their best day, but that they need more guys and more depth at that level. The questions was posed if Brett ever considered team chemistry when creating a roster. “It’s an interesting question about personalities, one I hadn’t really thought about how different personalities would perform together.” He spoke comparatively to the women’s team where the 2012 head coach mentioned that team chemistry played a role in who was chosen. Brett admitted that his program does not currently have the depth, and therefore does not always have the luxury, to always choose a team that considers personalities as a factor. The team, as a whole, are both hopeful and pragmatic about Doha. Each of the five members will come together as one unit led by automatic qualifiers Sam Mikulak and Yul Moldauer. It’s important to note that every member of the five-man squad, in addition to the alternate, come from the NCAA system. With the recent announcement of UIC cutting both men and women’s gymnastics after the 2019 season, and with the importance of NCAA team pipeline to the US elite program, how is Brett helping fight for the future of men’s gymnastics? Brett McClure knows first-hand the difficulties associated a university cutting a men’s gymnastics program. He suggest that, if the leadership of the university will allow for it, each team should be fundraising and should be prepared for any situation. He helped create the Cal Benefit Cup and the Cal Benefit Camp to raise money to support his team. He helped the program survive another three years before taking over the position with USA Gymnastics. In light of the climate surrounding USAG, one that is shoulder-deep in lawsuits, Ms. Behel proposed it might be necessary for Mr. McClure to begin a similar program for the elite system. Brett countered that he doesn’t believe they are there yet, but it’s a program he’s also ready to implement should that time ever be needed. The US men’s program is making progress with accountability and in its use of statistics and tracking under Brett McClure’s tutelage. He stated that the guys are his number one priority and that includes keeping them accountable so that they can achieve their own goals. They understand that because they are more accountable, their choices affect team selection. Brett considers the athletes as the utmost important part of the program and he will do everything in his power to make sure they have a secure and successful program. Through growth in conflict resolution, accountability, skill-development and support, the men’s team is looking for a successful trip to Doha next month with Brett McClure at the helm. I am reserving judgment on McClure for now. I like some of the things he\’s saying. Others, I\’m not sure about yet. The article itself is terrific though. There is little gymnastics reporting that is not Op Ed or satire-heavy. While those are fun, it is great to get some straight reporting. This was a clearly-written, interesting, and informative read. Very refreshing. Please give Behel more assignments. Thanks for the great article, Kensley! I love that a stats program is used for team selection, such a no brainer. It\’s really too bad NCAA men\’s programs keep being cut, it\’s clearly why there isn\’t more depth… that, and a lack of funding for the men\’s national team. 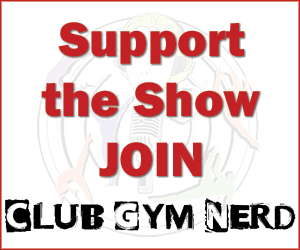 Young, talented athletes just don\’t see a long term future for themselves in the sport. I hope that changes. Also, loved this line – \”Sam is good, really good, but he has an Achilles heel and it’s not the one that required surgery last year\” too funny.